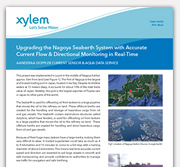 The scope of this project was to upgrade existing systems and continue to provide real time current speed and direction information to the port authorities and vessels. How well do you know about Process Qualifications and Validations? Our Xylem Analytics team will be on hand to answer your questions about our high quality water monitoring products from SonTek and YSI. Take advantage of YSI's exclusive trade-in discount! Visit our Xylem team at The International Association of Ports and Harbors (IAPH) Conference in Bali, Indonesia. Our Xylem Analytics team will be on hand to answer your questions about Tidelands and Aanderaa products.